Ted Cruz is feeling the Bern! 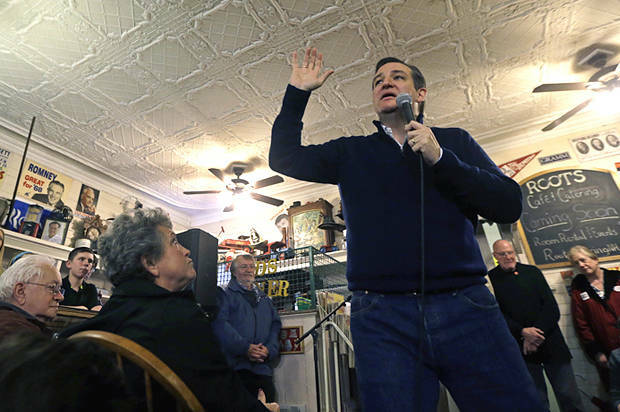 Ted Cruz in person, on the campaign trail, is a study in contrasts. What I principally mean by that cliché is that Cruz makes a more plausible human being when seen up close than in his animatronic television appearances, but he does not resemble a human being who came into the world by the usual method. He’s both cute and sinister, a highly discordant combination. He's like a marzipan man brought to life by the kiss of a magic fairy, stuffed into overly tight blue jeans and sent toddling into middle-school cafeterias in the middle of nowhere to answer strange hypothetical questions about Fidel Castro attacking ISIS. It’s all somewhat convincing, but you can still tell that under the 3-D printed clothing and the right-wing talking points, he’s sugary and delicious. Another contrast I observed on Friday evening during Cruz’s town-hall appearance in this strip-mall suburb just north of the Massachusetts border is the one between the idea of Ted Cruz, fearless conservative warrior who has electrified the true believers of the right, and the real Ted Cruz who eventually showed up. Close to 300 potential voters and about 60 journalists packed into an overheated schoolroom here to meet the surprise victor of the Republican caucuses in Iowa, the firebrand who seeks to unite the evangelical and libertarian strains of the Republican Party and who prides himself on being loathed by the bipartisan Washington establishment. It was the nicest thing he said about any living politician all night. Ted Cruz is feeling the Bern. If they get together at the ham-radio store, they’ll have a lot to talk about. Except that Bernie has the look of a guy who’s always snacking and can’t help himself, especially when Jane is not around. If he just pulls off the marzipan man’s arms and eats them it would be a sad ending to the story.